Dell had their TechCenter Rockstar program running and EMC had the EMC Elect program to appreciate the social contributions. From this year, following the merger, Dell EMC have combined these programs to form the all new Dell EMC Elect program. 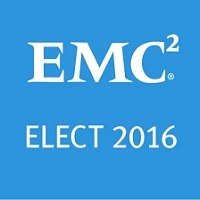 Wanna be a founding member of the Dell EMC Elect program? If you believe your (or your peer’s) contributions deserve to be recognised, nominate now. Dell Rockstar and EMC Elect were two of the leading community recognition programs in the industry. VIP treatment at major Dell EMC events (even though I’ve never been to EMC World before), blogger briefing sessions, goodies etc… are some of the attractions of the Elect program. With the new edition, the expectations are really high. Here’s the link for you to nominate self or your peers. Your contributions will be validated by an expert panel formed by EMC Elect founders and members. Time is running out. Nominations are open until 17th March only. This entry was posted in EMC, Recognition program and tagged Dell EMC Elect, Dell EMC Elect 2017, nominations. Bookmark the permalink.